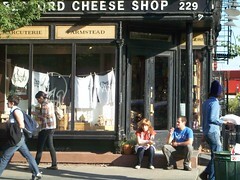 Sheri Lavigne’s inspiration for Calf & Kid, the cheesestore she plans to open at the Pearl later this year, is the Bedford Cheese Shop located in the Williamsburg section of Brooklyn. Like the clerks at Bedford Cheese Shop, Sheri intends for Calf & Kid employees to be knowledgeable about cheese. They should be able to suggest cheeses for a cheeseboard, pairings with wine and offer tasting notes (with free samples). She intends to start with a portfolio of about 80 cheeses and hopes to grow this to about 150 cheeses. Sheri expressed an interest in stocking both Northwest cheeses as well as cheese from other parts of the U.S. Having just returned from the American Cheese Society Annual Conference in Austin, she seemed particularly impressed by the artisan efforts of Wisconsin cheesemakers. She cited Montgomery ‘s Cheddar, gooey cheese and fresh cheese as types of cheese she would like to highlight at Calf and Kid. She hopes to dedicate a portion of the retail space to tastings and “Meet the Cheesemaker” events. When asked about her reasons for opening the store on Capitol Hill, she mentioned that she and her husband reside in the neighborhood and felt that, “Capitol Hill needs a great cheese shop really badly”. Indeed, since the closing of the excellent James Cook Cheese Company in Belltown back in 2002, Seattleites have had to venture down to Pike Place Market to find cheese mongers. If you wish to sample some of Sheri’s cheese selections skills, contact her for information on her collaboration with Poco Wine Room in a wine tasting on 9/17. Love sheep and goat cheeses. Hope it not too pricey. Interestingly goat cheese from Denmark is simply excellent.